Was Dragon Age: Inquisition your pick for game of the year? 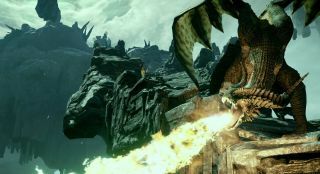 In truth, it doesn't really matter how you feel, because Electronic Arts has announced that the Dragon Age: Inquisition Game of the Year Edition is coming next month. The GOTY Edition will come with literally everything, "including all the story and gameplay content ever released," like Jaws of Hakkon, The Descent, and Trespasser, and all official add-ons as well: gear, weapons, mounts, and everything else that came with the Deluxe Edition of the game. BioWare said on Twitter that the Dragon Age: Inquisition Game of the Year Edition will sell for $60 (international pricing hasn't been set) and will be available in both physical and digital editions. It's scheduled to come out on October 6. Find out more at the Dragon Age website.